We identify and fulfill healthcare opportunities that will improve the quality of patient care, add convenience and efficiency for the practitioner, and provide high quality and cost-effective technology applications that result in a positive return on investment. Our team has been building hyperbaric chambers for over 35 years to since 1973. The experience our team brings is unsurpassed – many of our team members have been with Sechrist for over 20 years. From the start, we have been customer driven and have operated with a core set of values that define who we are and how we want to be known. These quality driven values form the foundation of our business and establish a solid presence the world recognizes as Sechrist Industries. We identify and fulfill healthcare opportunities that will improve the quality of patient care, add convenience and efficiency for the practitioner, and provide high quality and cost effective technology applications that result in a positive return on investment. Our team has been building hyperbaric chambers for over 35 years. The experience our team brings is unsurpassed – many of our team members have been with Sechrist for over 20 years. From the start, we have been customer driven and have operated with a core set of values that define who we are and how we want to be known. These quality driven values form the foundation of our business and establish a solid presence the world recognizes as Sechrist Industries. Sechrist strives for a culture that rewards a commitment to creativity, innovation, total quality and integrity in all that we do. Sechrist treats all employees with respect and dignity and rewards them when they exemplify our values. When we work as a team and adhere to these values our results will be far greater than the sum of our parts. Sechrist is a team of dedicated professionals whose purpose is to identify, develop and sustain a global competitive offering of high quality technological and innovative solutions to the healthcare community. We identify and fulfill healthcare opportunities that will improve the quality of patient care, add convenience and efficiency for the practitioner, and provide cost effective technology applications that result in increased shareholder value. Sechrist Industries was founded over 45 years ago in 1973, by Ron Sechrist, a mechanical engineer with a passion for the research and development of new life-saving medical technologies. Sechrist Industries started by designing and selling its first model 2500 hyperbaric oxygen chamber to Long Beach Naval research academy. Since the huge success of that first hyperbaric oxygen chamber, Sechrist Industries has grown into a world-wide hyperbaric chamber manufacturer and supplier. Now in over 172 countries, with hyperbaric chambers in thousands of hospitals and clinics around the world; Sechrist continues to lead the hyperbaric therapy market. Since its inception, Sechrist Industries has continued to invest and support the hyperbaric oxygen therapy community. Sechrist Industries has spent millions on research, development, and public awareness over its 45 years of successful hyperbaric campaigns. Sechrist grew from a single idea, and a single product, to a huge world-wide corporation with multiple product groups including respiratory, oxygen mixers, patient gurneys, and countless other products and devices. The culmination of this was the Sechrist 4100H Monoplace Hyperbaric Oxygen Chamber, the largest diameter chamber on the marketplace, both then, and today. 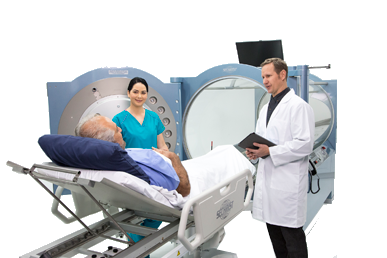 In 2017, Sechrist launched two ground breaking technologies to the world of Hyperbaric Medicine. Sechrist has designed and developed a dual-use Hyperbaric Oxygen & ICU Chamber for the Veterinary marketplace. Shortly after that, Sechrist introduced the new E-Gurney™ Electric Wheeled Stretcher. The E-Gurney will allow caregivers to raise, lower, brake the stretcher with the touch of an electronic foot pedal. As the medical device market continues to evolve, Sechrist plans to continue to innovate and evolve along with it as market leaders. .
Sechrist supplies more monoplace hyperbaric chambers than all other manufacturers combined with over 1300 installed in the USA alone. Sechrist is the only true manufacturer for HBO chambers, with most precision components machined in Sechrist’s manufacturing facility. Sechrist supports our large installed base with a network of over 100 domestic and international distributors. For 45+ years, Sechrist has enjoyed an outstanding reputation for quality, trust and service supporting a strong market leadership position in a growing market. Sechrist products are built from uncompromised engineering and strict adherence to quality standards. Sechrist is a leading worldwide manufacturer of critical care neonatal/ infant/ pediatric ventilators, monitoring equipment, low pressure gas mixers and related products. Sechrist’s manufacturing facility is highly integrated, including complete acrylic tube casting and finishing capabilities (only facility in the US), a state-of-the-art machining capability, a paint shop and assembly/testing capability. The acrylic and metal hyperbaric chamber pressure vessels are manufactured to A.S.M.E., P.V.H.O and N.F.P.A. Codes and Standards. Sechrist has been qualified and maintains certification with A.S.M.E. as a pressure vessel manufacturer. Sechrist’s facility operates in accordance with F.D.A. G.M.P. regulations, and its products are Class I and Class II devices with F.D.A. marketing clearance. Sechrist’s Quality Assurance Program is certified by S.G.S. United Kingdom, LTD., to ISO 13485. Specified Sechrist products are certified to the European Medical Device Directive 93/42/ECC and the European Pressure Equipment Directive 97/23/EC.